The Nemucod virus has been detected to have a new version that uses a red background for its ransom note and currently demands 0.11471 BTC payment. Nemucod is a data locker ransomware that infiltrates the system to perform various malicious actions that allow it to encrypt target data and renders it inaccessible. Upon encryption, Nemucod ransomware drops a file named Decrypt.txt that contains its ransom message. We firmly advise victims not to rush to pay the ransom and attempt to regain the PC security by removing the threat. Usually, ransomware payload is distributed via spam email campaigns that present the malicious code in two ways. First, Nemucod ransomware may be hidden in a malicious attachment that contains word document with embedded infected macros or a JavaScrips file. Second, the ransomware code may be injected in a compromised website that has a low-security level. Thus a link to this site may be presented in the text of the email. Crooks may use official names of financial services like PayPal or software providers like Microsoft. Nemucod ransomware may also be spread via malicious redirect links, compromised social media profiles and file sharing services. In case that Nemucod virus has infected your system you should know some primary damages it caused to the PC. The infection begins once Nemucod malicious payload is started on the PC. First, it initiates a scan of all drives aiming to find predefined file types in its code. When it locates a file that matches with its target data list, Nemucod utilizes a combination of two strong cipher algorithms – AES-128 and RSA-2048 to encrypt the file and render it out of order. At this point, no particular malicious file extension is related to this new version of Nemucod ransomware. However, corrupted files which may be documents, photos, images, videos, databases, archives, music, projects, presentations and other frequently used file formats can be recognized by their not working state. The same message is depicted with white text over a red background. That image replaces the desktop wallpaper. For the purpose, Nemucod virus creates values in the Windows registry that modify the auto-execute functionality and enable it to change the desktop wallpaper and furthermore start its malicious executable file each time the Windows system is started. It is also likely that the ransomware deletes shadow volume copies which prevent data recovery by using this method. However, the previous Nemocod version has been successfully cracked by white hats, so they have released a freely available decryption tool for .crypted files. As security experts are currently investigating the case, we hope that the code of this new Nemocod version will be decrypted too soon. 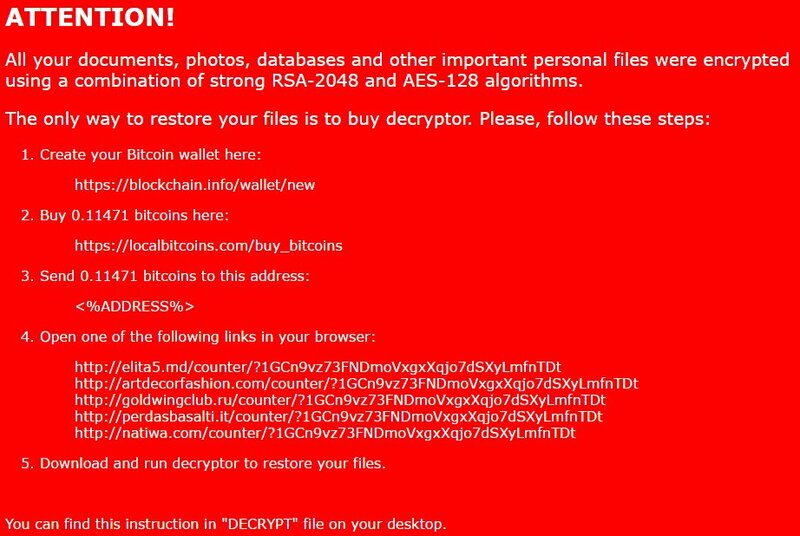 A malware researcher has created a decryptor for the New Nemucod ransomware that might be able to restore the affected files. It has been developed to work with the captured samples in several attack campaigns. However victims of the malware should not expect it to work with all versions. Computer viruses such as this one are constantly being updated and the tool may be able to help in all cases. You can download it by clicking here. Beware that the application will ask for elevated privileges by issuing a User Account Control notification prompt. The users need to click on “Yes”. This will start the automated file database recovery. Warning: this might take a few hours depending on your computer. The decrypter succesfully recovered the file database on your system. A license agreement follows, if accepted the decryption process is started. Remember that file recovery does not remove the virus from the computer, it merely restores some of the affected data. The only way to prevent and remove active infections is to use a quality anti-spyware solution. Refer to our instructions below. WARNING! Manual removal of Nemucod virus requires being familiar with system files and registries. Removing important data accidentally can lead to permanent system damage. If you don’t feel comfortable with manual instructions, download a powerful anti-malware tool that will scan your system for malware and clean it safely for you. WARNING! All files and objects associated with Nemucod virus should be removed from the infected PC before any data recovery attempts. Otherwise the virus may encrypt restored files. Furthermore, a backup of all encrypted files stored on external media is highly recommendable.